Moving your files from one cloud storage service to another is quite a hassle. Just imagine how bothersome it would be especially if you have hundreds or thousands of files stored in your cloud storage account. It’s just that there is really no need for you to go through all that trouble. All you need is to sit back, relax and just let those web apps like Mover do all of the hard work. Mover is a free web application that is developed by a startup company that is currently based in Alberta, Canada. With this application, you can securely transfer or move your files from one cloud storage service to another. 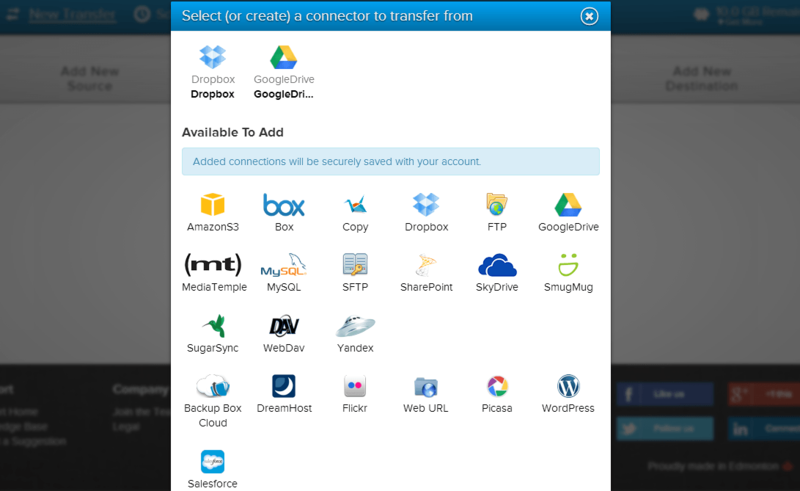 This means that you can seamlessly transfer your files from Google Drive to Dropbox to Copy to SugarSync to SkyDrive to AmazonS3, etc. Plus, there is no need for you to download or install any software. Just create a free account, setup or schedule a new transfer and simply wait until everything is all done. Allows you to transfer files between cloud storage accounts without having to download the files to your computer first. In other words, direct transfer of files from one cloud storage account to another. NOTE: When you transfer a file from one cloud storage account to another with Mover, Mover essentially creates a copy of your file on the destination cloud storage account. In other words, Mover does not delete files from source/original cloud storage accounts — it makes copies of files and stores those copies on the destination cloud storage account. NOTE: To transfer your files from one cloud storage account to another, your files are temporarily stored on Mover’s server (the file transfer process is: cloud storage account 1 servers -> Mover servers -> cloud storage account 2 servers). The developer of Mover says files are automatically deleted off Mover’s servers after they have been transferred to your destination cloud storage account. Supports many types of cloud storage services such as Box, Dropbox, Google Drive, SugarSync, SkyDrive, AmazonS3, Copy, SmugMug, SharePoint, etc. Also supports FTP file transfers, Flickr – Picasa photo transfers, etc. You get a $10 worth of free credits that is equivalent to 10GB of data transfer. This allotted data is consumable and once it’s all used up, you can add more but you need to pay $1 for every 1GB of data that you want to add to your account. Provides a detailed list of your current and previous transfers which basically includes the date and time that your files were successfully moved, etc. You don’t have to provide your cloud storage account usernames/passwords to Mover for most, if not all, of the supported cloud storage services. Mover acts as an app for the supported cloud storage services, meaning you have to grant API access — you don’t give Mover your usernames/passwords. It is just like adding an app on Facebook or Twitter. Is not instant transfer from one cloud storage account to another. How long it takes to transfer a file depends on current server load, but you may have to wait a few minutes before a transfer actually happens. As mentioned above, the way Mover works is by creating a copy of the original file from source cloud storage account and storing that copy on destination cloud storage account. 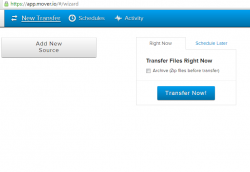 This way of transferring files has its usefulness but, for anyone that doesn’t want to keep original files on source cloud storage accounts, there appears to be no option to make Mover delete original files from source cloud storage accounts and only keep files on destination cloud storage accounts. Occasional bugs and glitches such as failure to add a new connector, failure to select a new source or destination, etc. There are still a lot of cloud storage services that aren’t supported such as ADrive, Cubby, Carbonite, JustCloud, Mozy, myPCBackup, Backup Genie, etc. For every connector/cloud storage account, there are certain file size limits. According to Mover’s developer, Box can only cater up to 500MB file sizes while SkyDrive can only cater up to 300MB file sizes, but Dropbox has no file size limit. Furthermore, this web application is very easy to use. All you need to do is to create your own free Mover account using your valid email and password. After which, you can instantly access the app’s web user interface. Not only that, you are also entitled to a 10GB worth of file transfers so you can easily move any file type regardless if it’s a collection of high-res photos, videos, office documents, etc. However, you need to keep in mind that you are not allowed to transfer files that would go beyond this limit. So if ever you have a 12GB file that you cannot split into multiple parts, then you need to upgrade your account to Pro. This also means that you need to increase your file transfer limit by paying $1 for every 1GB of data. In addition, the process of moving your files from one cloud storage to another isn’t difficult to do. Just setup a new transfer, link or add a new source, specify your file’s destination and then you click the “transfer now” button. It is also up to you if you want to move your files at a scheduled date or time. This also means that you can automatically repeat your file transfers according to your preferred schedule. For example, the web app will automatically move your files from Dropbox to Copy within the specified time or date interval – e.g., every hour, every day, every week, every month etc. So far, I haven’t experienced any serious issues with Mover except for the fact that it failed to link my Dropbox account during my first attempt to initiate a new file transfer. Luckily, it worked during my second attempt. You should also note that the amount of time that it takes to complete a file transfer will eventually depend on the size of your files. It would also be great if this web app could offer support to other cloud storage services such as JustCloud, Mozy, Carbonite, etc. The primary function of Mover is to move or transfer your files from one cloud storage account to another. It doesn’t go beyond that, but it doesn’t need to because that is the whole purpose of this web app. My favorite aspect of Mover is that you don’t need to download files to your computer to transfer between cloud storage services — Mover handles all that for you. Sure if you transfer a lot of files you will end up needing to pay for it but everyone gets 10GB of free transfers, which should be more than enough for the casual user. All in all, this web app does have some bugs and glitches that need to be ironed out, but is very commendable. Check it out.